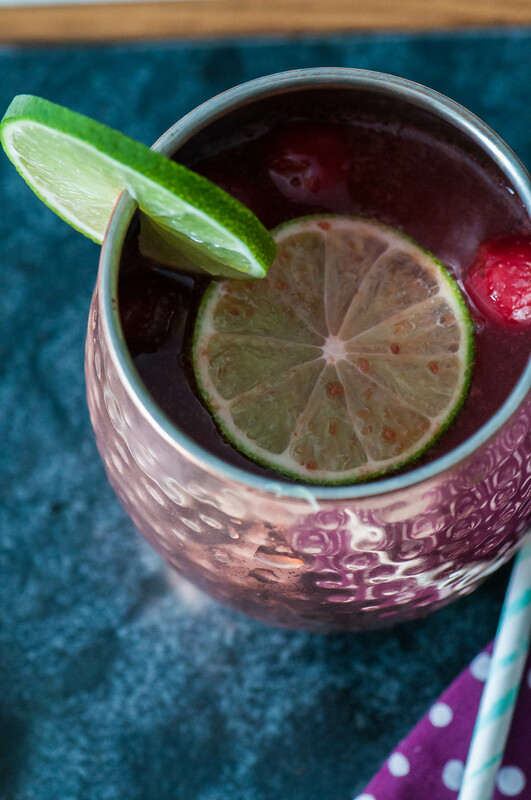 A spin on the traditional Moscow Mule, this Cherry Moscow Mule takes all the classic ingredients and adds sweet cherries to create the perfect drink for Spring. Light, zesty and sweet. I received some copper mugs for Christmas so I felt like it was my duty to create a recipe using them and nothing is better in a copper mug than a Moscow Mule. I’m not a big drinker but the Moscow Mule is one that I just can’t turn down. The combination of lime and ginger is just so light and refreshing. The traditional drink consists of ginger beer, lime juice, vodka and simple syrup to add some sweetness and is served in a copper mug. The copper mug is a must. It keeps it so cold and you just feel fancier. Ginger beer is an absolute requirement in a Moscow Mule too. It’s not actually beer but a carbonated gingery beverage that can be found in the mixer section. It has a more distinct, gingery taste than ginger ale so do your best to find ginger beer. I decided to change up the traditional Moscow Mule this time around and add some sweet cherries into the mix to create a delicious little drink for Spring. All the classic ingredients are present in this Cherry Moscow Mule with an exception for the simple syrup which is switched for a simple, sweet cherry sauce that only takes 10 minutes to make. This ends up tasting like a boozy cherry limeade. As if you needed another reason to convince you. I tested these on Joel and at girls night just to make sure they were ready to share. I do it all for you guys. For the cherry sauce: place cherries, water and sugar in a small saucepan and bring to a simmer over medium heat. Cook for about 10 minutes, stirring and smashing often, until cherries have broken down. Place in blender and carefully blend until completely smooth. Place in a jar and refrigerate until cold. Cut each lime in half and squeeze 1/2 lime into each copper mug. Spoon 2 ounces (4 tablespoons) of the cherry sauce into each mug then 2 ounces of vodka into each. Stir until combined. Add crushed ice then 1/2 cup ginger beer into each. Stir lightly to combine. Garnish with limes slices and cherries.